Sharing our success stories is an important way to help spread awareness about the MagazineLiteracy.org cause. Many individuals throughout the United States have rallied their communities to donate magazines and spread literacy to those in need. The interview below with Katie Simmons shines a light on one of our most ardent literacy champions. For three years, Katie has introduced MagazineLiteracy.org to her community and received over 12,000 magazines for distribution. An audio clip from Katie talking about the empty bookshelves of a Boston homeless shelter can also be heard here. Q: How did you hear about MagazineLiteracy.org? A: I connected with MagazineLiteracy.org through volunteermatch.org. I have been a literacy tutor/mentor for inner city kids for 13 years. I saw the positive effect of my time, but wanted to promote literacy on a broader scale. The Magazine Harvest program has provided the perfect vehicle to branch into the community. Q: What was it like when you first became a part of the organization? A: The moment I received John’s first email I started brainstorming. By the end of the weekend, I had talked, typed and walked my way into a sea of generous donors with magazines. Kindness is contagious and I witnessed that as the magazine bug spread in Boston. Q: Throughout your tenure with the organization, explain some of your community accomplishments. A: I personally collected, sorted and delivered over 12,000 magazines from the back of my Jeep. I deliver to 18 programs including homeless and domestic violence shelters, inner-city literacy and bakery training programs, and an elderly day-program. I have permanent magazine donation bins at the nearby Whole Foods Market, three extended day programs in Brookline, Innerspace Yoga, HC Studios hair salon, a Boy and Girl scout troop in Needham and several dental offices. I helped coordinate a corporate sponsorship for tennis magazine subscriptions for Tenacity, Inc., a three-year literacy and tennis program for inner-city youth. Q: What is the overall mission you hope to accomplish through MagazineLiteracy.org? A: My goal is to help any shelter or literacy program with limited or absent literacy resources by providing an ongoing variety of magazines. Q: Describe some of the feedback you receive about the magazines you collect and donate. A: I am met with beaming smiles from the children and words of gratitude from the mothers on every delivery. I also routinely ask for feedback from shelter staff. The director of an afterschool program in a domestic violence shelter sent these wonderful quotes from kids in the shelter. Trish Hembrough, Director of the Adult Learner program at Project Hope commented that “magazines are engaging, not intimidating, and the women love having the resource.” The shelters have used the magazines to teach families about health and nutrition, finances, parenting, and positive images in the media. I also recall meeting a young woman and her baby boy in a shelter. She told me she and her son were moving into a new apartment on Monday so she was thrilled with the home/style magazines and was grateful for the parenting magazines too. She commented on a caption about how to raise a polite child. All of the shelters have said the magazines provide an immense source of stress relief for their residents. Q: What event do you feel was the most successful in spreading awareness about MagazineLiteracy.org in your community? 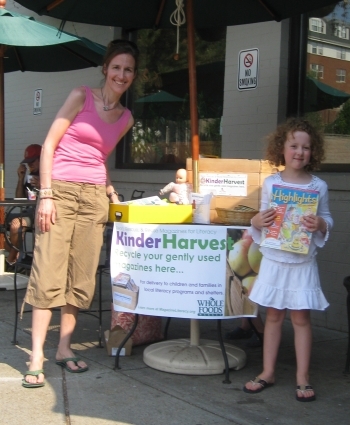 A: In the fall of 2007, I stood outside my local Whole Foods Market and distributed fliers about the organization to their customers. I later worked out a partnership with the Brighton Whole Foods to develop a program, including a permanent collection bin for gently used magazines. Q: How has the community responded to MagazineLiteracy.org? A: A sentiment echoed by everyone that hears about my work is, “What a great thing you do Katie…I have magazines to donate and I know others you can contact for magazines.” Consumers are happy to see their magazines going to help someone else. It has been a continual chain of generosity. Q: What keeps you involved with MagazineLiteracy.org? A: Knowing Massachusetts has thousands of homeless families fuels my mission to ensure that the corners of the community in vital need receive the joy of magazines. The stream of positive feedback from staff, families and children in the shelters confirms this is what I am meant to do. Q: What’s your next goal for MagazineLiteracy.org? A: With much-needed financial support, my goal is to establish and head a sustainable, ongoing distribution center for Boston and the surrounding region. It will serve as a model for the country where I can rally volunteers to collect, sort, label and distribute magazines. We must also enlist more sources of magazines, define agency needs, and form partnerships/mentoring programs. The precarious state of the economy, environment and education system is at the forefront of the world’s stage so I am pleased to have found a mission where the product is attainable and the payoff is priceless. By sharing our collective good karma, we can help the world one magazine at a time. Besides, I like my nickname: Katie the magazine lady.